Before going vegan, eggs were a staple part of my diet (especially at uni) and so I was quite worried about making the big transition of cutting them out despite knowing it was what I wanted to do. There are all sorts of egg alternatives available now, I know Follow Your Heart have a ready made egg replacement, but I thought I would try a tofu scramble for something I can use for breakfast/brunch. To this specific recipe, I added some Violife cream cheese to make the flavour slightly creamier - and I always used to like a slight cheesiness to my scrambled eggs anyway! It only takes around 10 minutes to make and is really filling. Ingredients: serves 2 (for on toast etc. ), but if you want it as part of a fry-up breakfast maybe split between 4. Such a simple recipe as you can see, and one that is really easy to incorporate into brunch meals. You can also alter the flavour of these really easily, by removing the cream cheese and switching for something else - maybe a curried version with more spices, or using it as part of a brunch burrito with beans, rice, tomatoes and avocado. The options are endless, and I'm excited to try more! One of the most daunting things about transitioning to a vegan diet is finding the best plant-based alternatives to the staple items in your kitchen. Finding the perfect plant milk is one of these, as many are more effective for certain purposes than others, and this guide will seek to help when choosing which milk to opt for. There is no point in assuming these will taste like dairy milk in any way, because they don't, but when you find the right ones they are delicious. Cereal/porridge: for this, you can essentially use any plant milk on the market as they all compliment cereal in different ways, and in reality this one just depends on your personal preference. 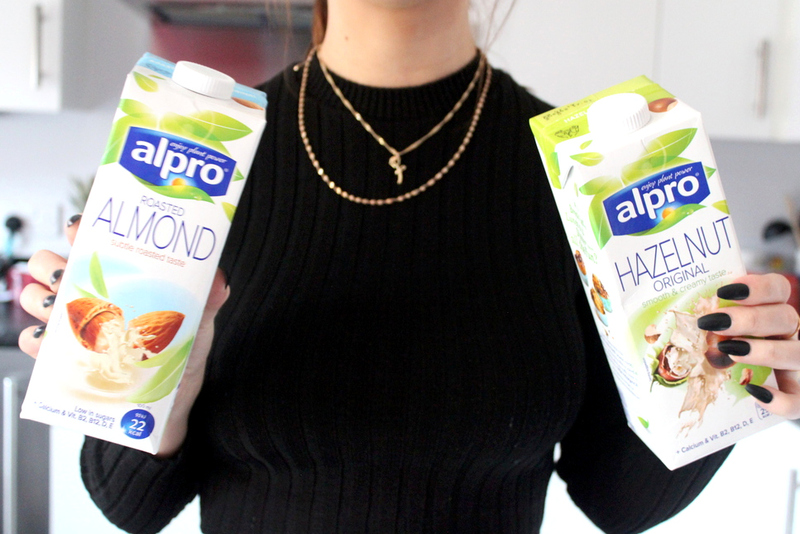 My favourite for cereal is hazelnut milk as it has a really rich and unique flavour which adds something extra to your cereal, but when I don't have this at home I just reach for whatever is available. If you want to really treat yourself, try chocolate soya milk in porridge. Sweetened versions of plant milks usually work best for pairing with cereal. Hot drinks: this is something that scares off a lot of new vegans as the milk can seem to almost separate when in a hot drink - this isn't actually anything to be bothered by but it's understandable to not want this. If this bothers you, try the Oatly Barista edition milk, it's specially made for hot drinks and also I find oat milk to be the one which doesn't alter the taste of tea or coffee - and avid hot drink lovers will appreciate this I'm sure. Cooking: milk can often be a component to many recipes in cooking and this of course needs to be chosen correctly to avoid the risk of the flavour being thrown off. For curries, always opt for coconut milk as it works the best and is commonly used anyway even in non-vegan dishes (or, try the Oatly cream for something even creamier). For use in making sauces - for example a vegan cheese or alfredo sauce, I stand by oat milk once again, or rice milk works pretty well too. Maybe opt for unsweetened versions to ensure the taste isn't off. Baking: this is another that generally can universal, however my favourites are almond milk and oat milk. You can adapt the milk flavour to the recipe you're creating too, and even could use chocolate soya or almond milk when you're baking something chocolate flavour for extra richness. A lot of recipes for baking require you to mix the milk with cider vinegar to create a 'buttermilk' type thing, so sometimes this can change the taste - so perhaps don't be too concerned with what type of milk you choose here. Hopefully this makes things a little easier when deciding your plant milks of choice, and let me know your favourites in the comments! I'm always up for trying new brands and types considering so many new products get released these days. I'm starting a new series on my blog titled 'how to vegan', as a way of making meals and takeaways more straightforward to new vegans or those transitioning, and thought as Veganuary is underway this would be the perfect time to begin. Chinese food is one of my all time favourites, and although some of you might be on new year diets and wanting to avoid takeaways, this guide will prove helpful throughout the year anyway. These guides will aim to give some basic pointers as to how to navigate your favourite meals/cuisines as a vegan and make life slightly easier, as well as demonstrating that you can always join in with non-vegan eaters when they order food. The obvious options: this might be something of a no-brainer, but starting with the basic options that are undoubtedly vegan can get you a pretty substantial offering of choices already (although if you ever are concerned about cross contamination, or where the items are cooked definitely consider contacting the shop before ordering). My ultimate favourites under this category are salt and chilli chips (divine), crispy seaweed and vegetarian mini spring rolls. With a side of curry sauce you've got yourself some tasty options already. Noodles: this isn't always guaranteed, but it is common for some takeaways to use wheat noodles rather than egg noodles - meaning vegetarian/mushroom chow mein and plain fried noodle dishes are often vegan-friendly. This is one that is often worth checking beforehand, but if you are still concerned simply just switch to fried rice with no egg. Tofu based dishes: not all takeaways offer tofu based dishes, but where they do, it is delicious. It is deep fried so the classic tofu texture is usually not there at all, and can be found in a variety of styles - black bean, curry, or salt and chilli to name a few (which of course is my favourite, pairing nicely with the chips). If you are struggling to find tofu on the menu, look for deep fried 'bean curd' instead - it's just another name for it, and will probably be under the vegetarian options. If all else fails, a vegetable or mushroom curry could do the trick for your main dish. Veggie specialised takeaways: this is one for those who predominantly live in bigger cities, as in my small home town this isn't an option, but if you're lucky some Chinese takeaways actually specialise in vegetarian options, offering a selection of mock meats in classic Chinese dishes meaning the options are endless and nothing is missed out on. However, if you don't have access to this, I'm sure this post has demonstrated that it is always possible to create a substantial meal just by looking around the menu a bit more. So, that's the first 'how to vegan' guide dealt with, if there's any particular meals, restaurants or cuisines you would like to see next, leave some recommendations in the comments for inspiration and I'll try and give those a go, especially if you need help during veganuary! 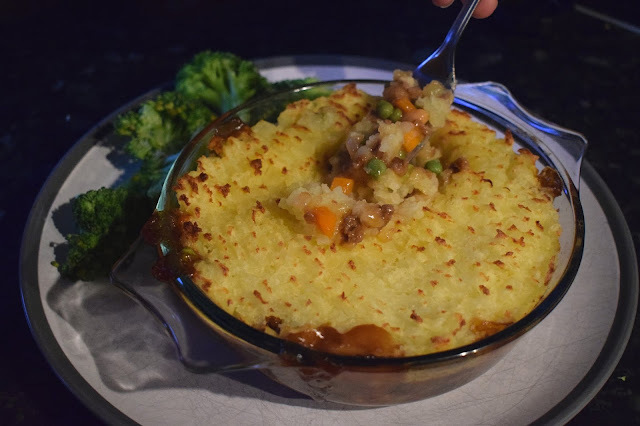 As the weather gets colder and more grey, I start craving more comforting winter meals such as shepherd's pie. This used to be one of my favourite meals before turning vegan, and with this recipe I threw together it remains one of my favourite recipes. The recipe here I have listed is for 1 serving (I made this for myself in a small serving dish as my family aren't vegan and so I am basing it on that, but just multiply the recipe to suit any needs and make it in a bigger dish and serve separately). The secret ingredient is baked beans - only a spoon or two - and before you squirm at the thought of it, it needs to be tested as it adds a lot of flavour and some extra protein. Serve immediately, with fresh cooked vegetables and extra gravy if you wish. In reality this is a very simple meal to make, and you can throw in any veg you want - or even make the mash with sweet potato! Instead of vegan mince you could also try this with lentils, it really is a super versatile meal and brings a lot of comfort in the cold winter evenings.